Al pastor is a dish is popular in Central Mexico. Not to be confused with the spit-grilled shawarma of Lebanese culture, Al pastor meat is typically pork-based in nature and is marinated in a combination of dried chilies, spices, and pineapple. It is believed that the Mexican Al pastor originated from the Arab’s shawarma grilled meats. Having been derived from such a cooking style, tacos al pastor is similar to the Turkish döner kebab and Greek gyros. However, the Mexican meats made in this style can commonly be found in dishes such as gringas, alambres, and huaraches. 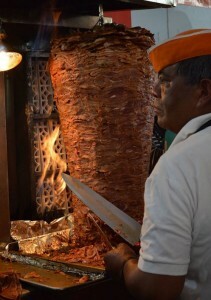 The marinated meat is cooked on a slow turning vertical rotisserie (called a trompo) with a gas flame. It is not uncommon to add other spices to the meat, such as achiote, a seed that imparts a subtle flavor and a reddish-orange color to the dish. Once mounted to the trompo, a piece of onion and pineapple is speared on top of the meat to help add even greater flavor. Once fully cooked, the meat is removed from the spit in very thin slices and served on tortillas with simple toppings such as cilantro, onions, lime juice, salsa, and occasionally pineapple. While we won’t blame you if you don’t have a trompo hanging around in your kitchen, you can still enjoy tacos that are cooked in a similar style to Al pastor. What makes Tacos Al Pastor delicious is the marinade and slow cook time of the pork. Try this recipe by BonAppetit for a similar Al Pastor experience! Grill tortillas until soft and beginning to char, about 30 seconds per side. Slice pork against the grain into ¼” strips. Top each tortilla with a few pieces of pork and some pineapple salsa. Serve with lime wedges for squeezing over. To learn more about Mexican dishes and culture, be sure to read our blog, or visit any Mexicali Fresh Mex Grill location in Massachusetts or Connecticut. We look forward to cooking with you!